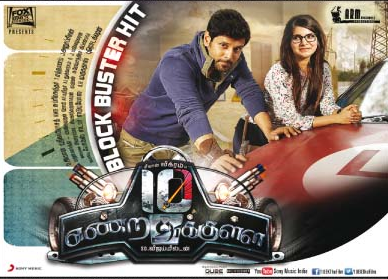 After the heavyweight 'I', Vikram is back with a breezy 10 Endrathukulla where he isn't required to strain much. The star looks cool in casual costumes. His attitude and grace is the film's biggest plus point, as he fits into the role of a professional daredevil car driver who doesn't miss his assignments and appointments. 10 Endrathukulla also offers mighty scope for Samantha to unleash her range as a performer. Her childish, dumb side that was revealed in the trailer is seen for a major part of the film, but there is also a surprise towards the end. Her cutesy girly expressions are bound to impress young men. The fun, twists and conflicts in the tale arise from Samantha's character Shakeela. The journey that (our nameless driver) Vikram takes along with Shakeela is the film's core idea. This journey takes them from Chennai to Mussoorie in Uttarakhand (though these portions have been shot in Nepal). We have the antagonists who have their own little motives, and Pasupathy stands out in this lot with his comic histrionics at unexpected moments. The likes of Rahul Dev and Abhimanyu Singh fit the bill as the standard brooding villains. And many of the kids from Goli Soda are seen in the film, making cameos. Imman's numbers sound good and the choreography for 'Vroom Vroom' by Sridhar is enjoyable. Vikram charismatically aces his moves along with the dancers, while Sridhar also makes an appearance in this song. 'Aanalum Indha Mayakkam' is used to establish the bonding between the lead pair, and there is an obvious romance angle in due course. 'Gaana Gaana' with Charmi is a needless exercise. The racy theme track plays along during the stunt scenes, which are numerous in number. Anoop Seelin takes care of the BGM score. Few of the car chases and stunts are interestingly done and in few other instances, they go over the top. The tacky VFX counts among the negative aspects of the film. More care could have been taken on the VFX, given the presence of big producers bankrolling the film. The key intro scene of Vikram is let down by the frivolous visuals. The 2nd half feels like a stretch, with the key reveal held back till the finale and too many cinematic liberties taken for the climax action sequences. Sreekar Prasad's cuts are interesting in the early part of the film when Samantha is introduced amid a frenzied chase scene with Vikram behind the wheels. Some of the picturesque locations that we see in the film are good takeaways. In all, director Vijay Milton has presented a ride that has its share of bumps. Go see the film for its lead pair. Verdict: Not as racy as expected, but a watchable ride.